Guess who's finally participating in Meat-free Mondays again? Okay, that wasn't a very difficult guess. Okay, how about this one: guess who likes Mexican food? Again, maybe not the most difficult one to guess. Okay you got me, I don't have much to say about this, except that it was pretty damn tasty and the spinach sauce on top (if I do have to say so myself) turned out to be an inspired choice. The reason why I don't have much to say isn't because this dish is blah (FYI - it.is.not.blah. ), but rather because I just have a lot of other stuff on my mind at the moment. Such as my super-cool new computer at work. Super-fast, NOT crashing every 5 minutes (like my previous computer) and wrapped up in a sleek black package. And did I mention that I'm now using Windows 7? No wait, come back!!! I promise I won't be a weirdo, geek, computerN3RD. Okay I can't promise that. You'll have to put up with any future nerdiness that creeps into my posts. Seriously though, I'll cut the geek quotient of this post by just summarising with - Windows 7 is awesome. Try it, and let me know what you think. Oh, and make some enchiladas to go with your new snazzy computer. The two make a winning combo! 1. Cook spinach in a little bit of water until just wilted. Remove from heat, drain and puree to a pulp in a food processor. Add yoghurt, salt and pepper to taste, stir through and set aside. 2. Meanwhile, heat olive oil in a frying pan over medium heat, add onion and garlic and saute for a few minutes until soft. Add cajun spice and corn, fry another 3 or so minutes, then stir through the beans. Add salt and pepper to taste, then set aside. 3. Now get your tortillas ready and spoon some of the corn/bean mixture onto each one. Top with mexican salsa and a little bit of grated cheese (will use about 1 1/4 cups here) and roll into long sausages. 4. Transfer the rolls to a casserole dish. 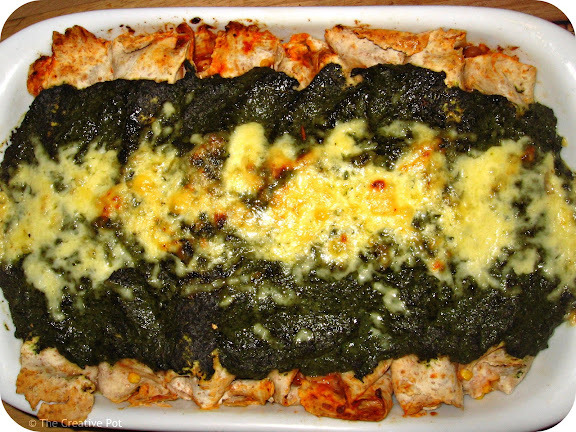 Spoon the spinach sauce on top and top with the remaining 1/4 cup of cheese. 5. Bake at 180C for about 20 - 30 minutes, until golden brown with cheese melted & bubbling on top. This is the perfect example of the kind of meal that I want to eat alone. I hate going back for seconds only to find that the greedy people ate all the good food. Geez, that is one intense spinach sauce you have here!!! !Looks amazing!!! so easy and healthy!! I guess even my little girl will eat her spinach now! This is a great vegetarian dish! There seems to be so much flavor, I don't think a non-veggie would miss the meat at all. I have heard such good things about Windows 7! I need to upgrade soon. As for the pumpkin pie bars, I used about 1 3/4 cups pumpkin. Ek is SOOO met jou oor Windows 7! So, baie geluk met jou nuwe rekenaar!! Ek is BAIE bly saam met jou! Geniet hom..